I don’t know about you, but sometimes I just want to be crushed flat by the metal I listen to, like an ant beneath a boot. But — as the last flow of viscous liquid leaves my mangled body — I do like to have a smile on my face. 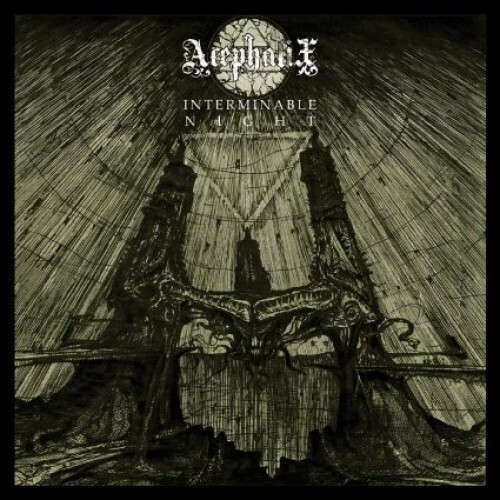 The new album from San Francisco’s Acephalix, Interminable Night, does this nicely — smashes you flat in a pool of your own goo, but leaves you with a ghoulish grin as the rictus sets in. Catastrophic death metal really doesn’t need any bells and whistles to achieve its primal effect. Down-tune the guitars and set them spinning and belching out toxic clouds of oily smoke; load up the drums with full belts of high-caliber ammo and pull all the way back on the trigger to spray the landscape with full-auto, d-beat destruction; chain a bear to the ground and then taunt him until he’s in full-throated, pissed-off, roaring mode; then set the whole thing on fire so you get the right level of energy from the performers, and you’re good to go. That’s the winning formula of Acephalix. But to return to the fundamentals, Acephalix have them in spades. The riffs on this album are massive, and the rhythms clutch greedily at the part of your brain that jolts your head up and down and makes your golem-esque body want to slam into other people. And in keeping with the deep roots in Dismember, Entombed, and Nihilist, you won’t find a single blast-beat on this album. Kind of refreshing, in a death ‘n roll kind of refreshment. Everyone in the band is firing on all cylinders, but vocalist Dan deserves special mention. He has great range — from those pissed-off bear-roars to a rising shriek of demonic rage, and he can hold his notes for an inhumanly long time, too. The unspoken message is clear: Your puny life is forfeit to the darkness. 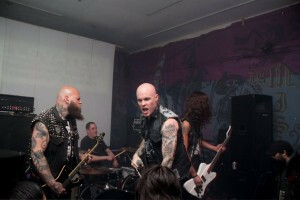 Interminable Night is available now from Southern Lord in a one-time CD pressing of 2,000, and the reports are that Acephalix is nearly finished with their next Southern Lord album, which should see release in late September or early October. For more info, visit these scary people at their official site or their Facebook page. You think they’re awesome (and they are…no doubt) check out the band Vastum which has three of the four members of Acephalix. This band absoulutley kills. Ooof! That’s awesome!. Love those guitar solos, and Dan’s vocals are again fantastic. I saw that 3 of them were in Vastum and meant to check out that band. Thanks for the reminder.